Every day is Awareness Day for those who suffer from fibromyalgia. Every year May 12th has been designated as “Fibromyalgia Awareness Day” to shine a light on this invisible illness. Most of us who suffer from this chronic condition feel that every day is our awareness day, as we often have to explain what it is to people. Trust me when I say it is more than what you see in the pharmaceutical commercials on TV. Some days are better than others. I usually can tell what kind of day I will have shortly after waking up – is it a struggle to wake up and get out of bed? How stiff and slow am I moving once I do get up? Am I able to complete a decent workout, or am I just going through the motions or just doing some gentle stretches? The medical profession tends to try to throw pills at this condition. Pills for sleep, pain, muscle spasms, anti-depressants. And while there are many drugs approved for managing the chronic pain associated with fibromyalgia that may help many people cope every day, long ago I adopted alternative strategies. My body reacts too much to the side effects of medications, so I shy away from them. And now new studies indicate some of these approved drugs can do more harm than good. “A new study evaluating two drugs commonly prescribed for fibromyalgia, Cymbalta and Savella, shows that these drugs are often more harmful than helpful. I have found some things that work well for me. Now don’t get me wrong, I still have pain every single day – morning stiffness and aches when I rise, But most days it is a level of pain I can live with and have adapted to. I do still get flares, in fact this passed week I experienced one for several days, but they are the exception, not the norm for me. Move It – Exercise and movement is so important. Atrophy is the enemy. I try to do something every day, even if it is only using the foam roller for myofascial release and some gentle yoga stretches. But I aim for a walk as well, either on the treadmill, elliptical, or outside with the dogs. Eat It – Diet is also very important, and I have written about this many times. I follow basically a Paleo type diet, with many tips and recipes from JJ Virgin and Cassie Ho. Oh, and Pinterest! But I am no expert. I am just a mom, a wife, an IT Manager, and I happen to have fibromyalgia. You may not know it if I didn’t tell you. I started this blog to try to share some of my experiences and what works for me. I have done a lot of research on my own over the years, as most medication hasn’t worked or has resulted in bad side effects. But everyone’s body is a different chemistry lab. We are not all alike and we all need different coping strategies. There are soooo many lovely FibroWarriors who, like me, fight every day to keep the flares at bay and do their part to shine a light on this condition. Please check some of them out! ❤ Together, we can make fibromyalgia visible. Brandi at Being Fibro Mom – She came up with the #ShineforFibro idea – Brilliant! Sarah at The F Word – With a blog name like that, what’s not to love? This day, May 12th, also happens to be the birthday of Florence Nightingale. Coincidence? I think not. She is the founder of modern nursing, and was known as the “The Lady with the Lamp” for making rounds at night to tend to wounded soldiers. Shining the light, and all. Like this quote from Florence Nightingale, I never want to lose an opportunity to plant the seeds and help bring attention to my condition. Hopefully one day researchers will find a definitive cause, better treatments, and (I can only hope) a cure for this condition. 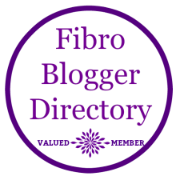 Do you feel more fibro “aware” now? What are your top coping mechanisms for fibromyalgia, chronic pain, or some other condition?